On 25 February AVO reported that seismicity at Great Sitkin had decreased to background levels during the past month and there was no evidence of explosive activity. The Aviation Color Code was lowered to Green and the Volcano Alert Level was lowered to Normal. Episodic recent and historic volcanic activity has been reported at Great Sitkin, located about 40 km NE of the community of Adak in the Aleutian Islands. Prior to the recent 2018 activity, the last confirmed eruption in 1974 produced at least one ash cloud that likely exceeded an altitude of 3 km (figures 1 and 2). This eruption extruded a lava dome that partially destroyed an existing dome from a 1945 eruption. Most recently, a small steam explosion was reported on 10 June 2018. In response, the Alaska Volcano Observatory (AVO) raised the Aviation Color Code (ACC) to Yellow (Advisory) from the previous Green (Normal). Figure 1. 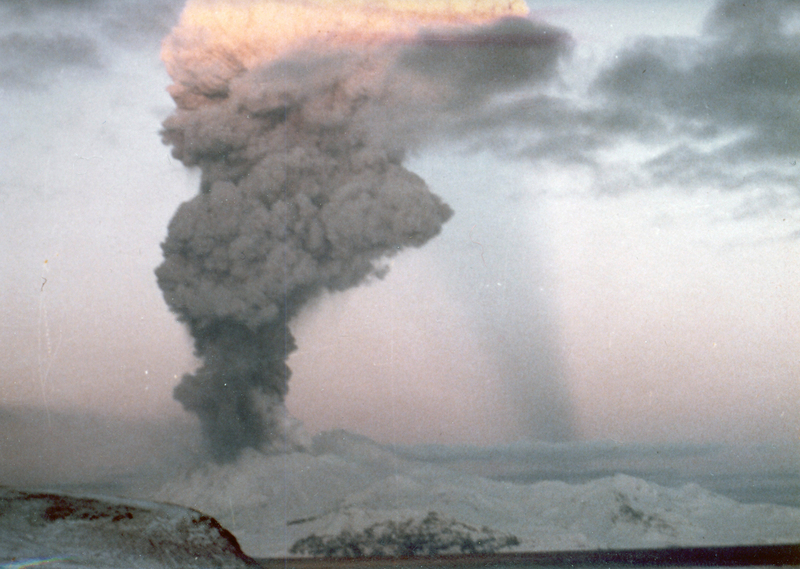 Eruption of Great Sitkin volcano in 1974. Photo taken from Adak Island, Alaska, located 40 km SW of the volcano. Photographer/Creator: Paul W. Roberts; courtesy of AVO/USGS (color corrected). Figure 2. Worldview-3 satellite image of Great Sitkin on 21 November 2017 showing the crater, areas of 1974 and 1945 lava flows, and steam (indicated by the red arrow) from the reported seismic swarm and steam event ending in 2017. Photographer/Creator: Chris Waytomas; image courtesy of AVO/USGS. AVO had previously reported that a seismic swarm had been detected beginning in late July 2016 and continuing through December 2017. Steam from the crater was also observed during this time period, in late November 2017 (figure 2). The seismicity was characterized by earthquakes typically less than magnitude 1.0 and at depths from near the summit to 30 km below sea level. Most earthquakes were in one of two clusters, beneath the volcano's summit or just offshore the NW coast of the island. Possible explosion signals were observed in seismic data on 10 January and 21 July 2017, but no confirmed emissions were observed locally or detected in infrasound data or satellite imagery. The most recent eruption at Great Sitkin produced a small steam explosion which was detected in seismic data at 1139 local time on 10 June 2018 (figure 3). The explosion was followed by seismic activity which began diminishing after 24 hours, and by 15-16 June had returned to background levels. Figure 3. View of Great Sitkin steaming on 10 July 2018. Photographed from Adak Island, Alaska, approximately 40 km SW. Photo by Alain Beauparlant; image courtesy of AVO/USGS (color corrected). Due to heavy cloud cover on 10 June 2018, satellite views were obscured. Subsequent satellite data collected on 11 June showed an ash deposit on the surface of the snow extending to about 2 km SW from a vent in the summit crater (figure 4). Minor changes in the vicinity of the summit crater were observed from satellite data, including possible fumaroles north of the main crater. 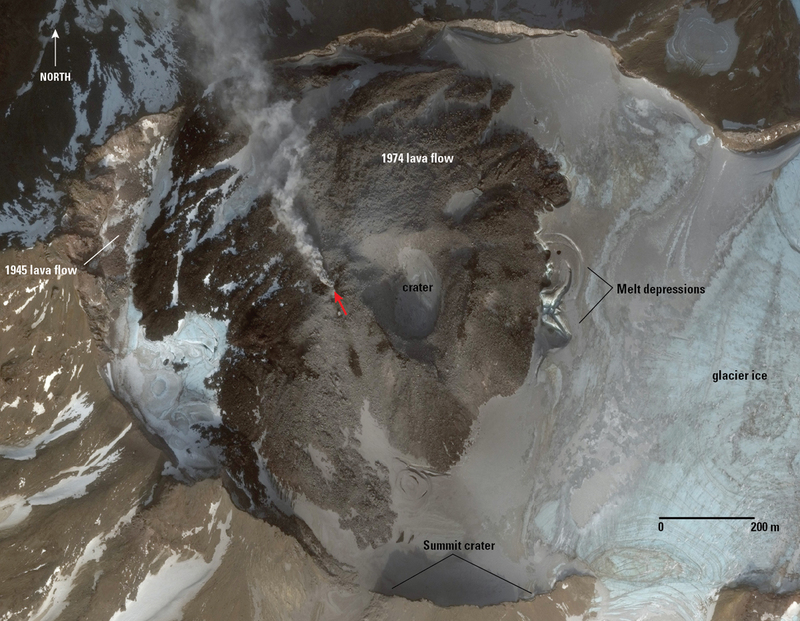 On 17 June an aerial photograph showed minor steaming at the vent (figure 5). Figure 4. Satellite view of the Great Sitkin crater at 2300 UTC on 11 June 2018 showing an ash deposit extending for about 2 km to the SW. Ash was likely deposited during the brief explosion on 10 June 2018. Minor steaming from a vent through the 1974 lava flow is also visible in this image. View is from the southwest. Photographer/Creator: David Schneider; image courtesy of AVO/USGS. Figure 5. Aerial photo showing minor steaming at the summit of Great Sitkin, 17 June 2018. A small ash deposit extends SW from the vent. Photographer: Alaska Airlines Captain Dave Clum; image courtesy of AVO/USGS. Another small phreatic explosion was observed in seismic data at 1105 local time on 11 August. Small local earthquakes preceded the event but were not recorded following the explosion. The event is similar to three other phreatic explosions that have occurred over the past 2 years. 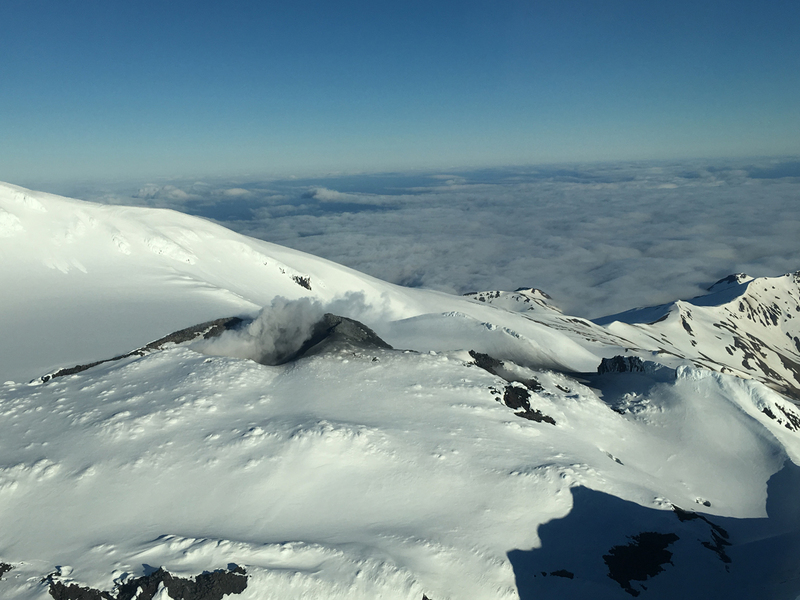 Information Contacts: Alaska Volcano Observatory (AVO), a cooperative program of a) U.S. Geological Survey, 4200 University Drive, Anchorage, AK 99508-4667 USA (URL: https://avo.alaska.edu/), b) Geophysical Institute, University of Alaska, PO Box 757320, Fairbanks, AK 99775-7320, USA, and c) Alaska Division of Geological & Geophysical Surveys, 794 University Ave., Suite 200, Fairbanks, AK 99709, USA (URL: http://dggs.alaska.gov/). AVO reported that a small phreatic explosion at Great Sitkin was recorded by the seismic network at 1105 on 11 August. The event was preceded by small local earthquakes. 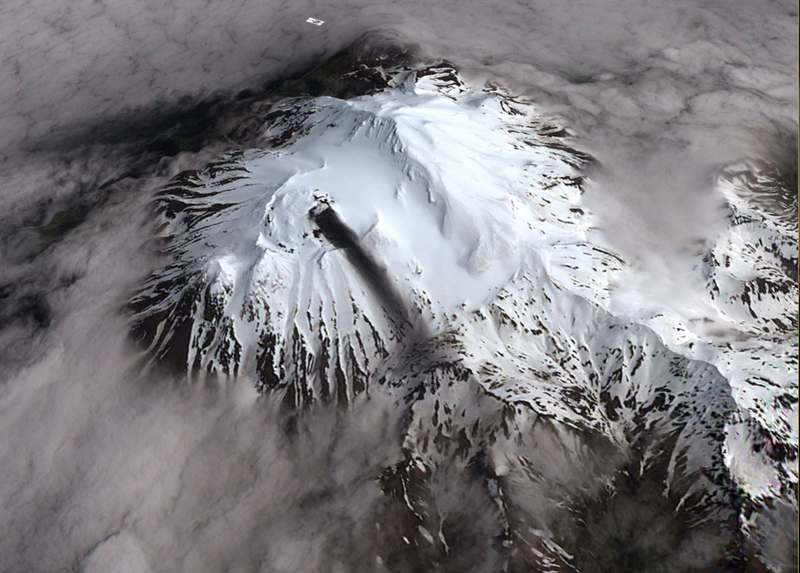 Cloudy satellite images prevented views of the volcano during 12-14 August. The Aviation Color Code remained at Yellow and the Volcano Alert Level remained at Advisory. AVO reported that after the brief explosion at Great Sitkin on 10 June seismicity gradually declined to background levels. On 27 June AVO lowered the Volcano Alert Level to Normal and the Aviation Color Code to Green. AVO reported continuing low-level unrest at Great Sitkin during 20-26 June; seismic activity remained at or near background levels. A recently analyzed satellite image acquired on 11 June, one day after short-duration explosive event was recorded, showed a minor ash deposit on the snow extending 2 km from a vent in the summit crater. The Aviation Color Code remained at Yellow and the Volcano Alert Level remained at Advisory. 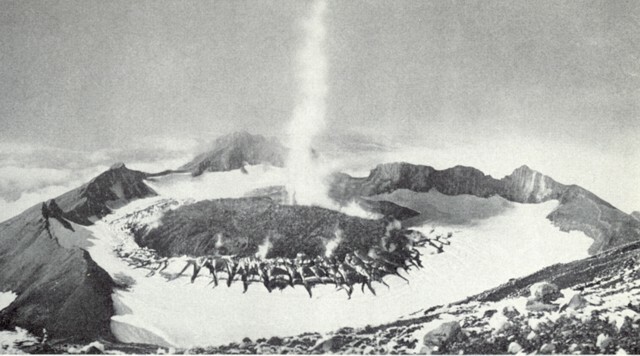 AVO reported that satellite images captured after the short-lived steam explosion at Great Sitkin on 10 June indicated minor changes in the summit crater, characterized by possible new fumaroles in the N part of the main crater and slightly more vigorous steaming at pre-existing fumaroles. Seismicity declined to background levels during 15-16 June. Seismicity at Great Sitkin was elevated during the previous five days, though at 1139 on 10 June a seismic signal indicating a possible short-lived steam explosion prompted AVO to raise the Aviation Color Code to Yellow and the Volcano Alert Level to Advisory. No infrasound signal associated with the event was detected, and no volcanic clouds rose about the meteorological cloud deck at 2.4 km (8,000 ft) a.s.l. On 18 January AVO reported that seismicity at Great Sitkin had declined over the past two months to near background levels. In addition, no significant activity was observed in satellite data during this time period and no steam plumes were noted. AVO lowered the Aviation Color Code and Volcano Alert Level to Green/Normal. AVO reported that during 28 November-5 December low-level unrest continued at Great Sitkin. Nothing noteworthy was identified in seismic data nor in partly cloudy to cloudy satellite images. The Aviation Color Code remained at Yellow and the Volcano Alert Level remained at Advisory. Recent observations of a robust steam plume and a period of gradually increasing seismicity over several months at Great Sitkin prompted AVO to raise the Aviation Color Code to Yellow and the Volcano Alert Level to Advisory on 22 November. On 19 November local observers photographed a light-colored vapor plume rising about 300 m above the vent and drifting 15-20 km S. A satellite image acquired on 21 November showed steam continuously jetting from a small fumarole on the W side of the 1974 lava flow within the summit crater, and at least one area where snow and ice had been melted. Seismicity had fluctuated but increased overall since July 2016, most notably in June 2017. The seismic activity was characterized by earthquakes less than M 1, and occurred either just below the summit or just offshore the NW cost of the island, 30 km below sea level. Possible explosion signals were recorded in seismic data on 10 January and 21 July 2017, but there were no confirmed emissions. On 27 and 28 May, AVO recorded anomalous seismicity at Great Sitkin. The seismicity consisted of two periods of seismic tremor on 27 May (lasting for 20 and 55 minutes) and two earthquake swarms on 28 May (beginning at 0406 and 1328). The earthquake swarms each began with a relatively large event (ML (local magnitude) 2.2 and ML 4.3) followed by tens to hundreds of smaller aftershocks, most located 5-6 km SE of the crater at depths of 0-5 km. Both the tremor and the earthquake swarms represent significant changes from what is considered to be normal, "background" seismicity at Great Sitkin. However, aftershocks declined significantly overnight, and no tremor episodes were detected after the 27th. There were neither signs of surface volcanic activity on satellite imagery nor ground-level reports of anomalous activity. Great Sitkin remained at Concern Color Code Green. The following was cabled from the Geophysical Institute on 22 February 1974. "Explosive activity was observed at 1855 local time from Adak, 48 km WSW of Great Sitkin volcano. An earthquake originating at the volcano of Richter magnitude 2.6 occurred at the time of onset. An estimated 10,000-foot light-colored plume was reported over the summit at dusk. Since that time bad weather has obscured the island." Information Contacts: J. Kienle and D.B. Stone, Geophysical Institute, University of Alaska, Fairbanks AK; Dale Glover, NOAA, Adak AK. D. Glover reported that, on a helicopter inspection trip to the volcano on 22 February, he ". . . found that a large lava dome had been emplaced in the crater, with mostly steam and gas being emitted." Foul weather prevented observations on all but three occasions between then and 29 March. About one week after the eruption, he noted, through a high-power telescope, ". . . that the dome had been extruded a considerable extent, with some ash being emitted. Since then activity has decreased to steam and gas emissions." In mid-September, her reported that he had ". . . only been able to observe Great Sitkin volcano by high-power telescope and a few times from aircraft. The lava dome appears to continue to extrude with minor lava flows spilling over the lip of the crater. The size of the dome is hard to estimate but it is probably close to 700 m in diameter and 200-300 m high. We have recently installed seismic instrumentation on the volcano but we have not noticed any unusual activity." In summary, it appears that, following the initial release of the pressure head of volatiles on 19 February a dome has been extruded in the caldera of Great Sitkin. The new dome appears to be about the size of that extruded in 1945. Further, the dome is still active, overspilling the lip of the caldera as it grows. The extrusion has been quiet, with little of no associated explosiveness. Information Contacts: Dale Glover, NOAA Adak Observatory, FPO Seattle WA; Dan Shackleford, Villa Park CA. On 27 and 28 May the Alaska Volcano Observatory (AVO) detected anomalous seismicity at Great Sitkin, a volcano located 1,895 km SW of Anchorage, Alaska. On 27 May two periods of seismic tremor lasted for 20 and 55 minutes and on 28 May earthquake swarms began at 0306 and 1228. The earthquake swarms each began with a relatively large event (ML 2.2 and ML 4.3) followed by tens to hundreds of smaller aftershocks, most located 5-6 km SE of the crater at depths of 0-5 km. Both the tremor and earthquake swarms represent significant changes from background seismicity at Great Sitkin. However, aftershocks declined significantly overnight, and seismicity returned to background levels with a lack of recorded tremor since 27 May. Satellite imagery showed no signs of surface volcanic activity, and no reports of anomalous activity were received by AVO. Information Contacts: Tom Murray and John Eichelberger, Alaska Volcano Observatory (AVO) (URL: http://www.avo.alaska.edu/). 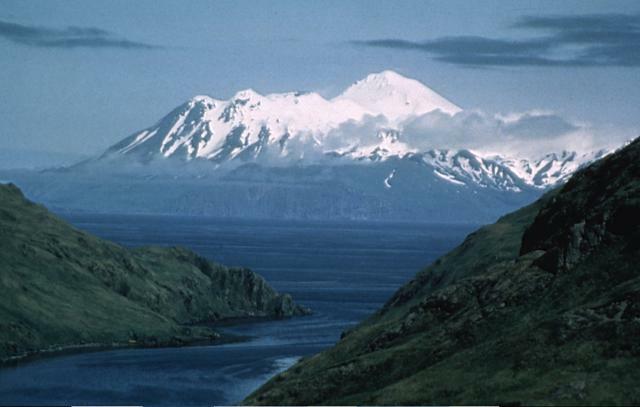 The Great Sitkin volcano forms much of the northern side of Great Sitkin Island. A younger parasitic volcano capped by a small, 0.8 x 1.2 km ice-filled summit caldera was constructed within a large late-Pleistocene or early Holocene scarp formed by massive edifice failure that truncated an ancestral volcano and produced a submarine debris avalanche. Deposits from this and an older debris avalanche from a source to the south cover a broad area of the ocean floor north of the volcano. The summit lies along the eastern rim of the younger collapse scarp. Deposits from an earlier caldera-forming eruption of unknown age cover the flanks of the island to a depth up to 6 m. The small younger caldera was partially filled by lava domes emplaced in 1945 and 1974, and five small older flank lava domes, two of which lie on the coastline, were constructed along northwest- and NNW-trending lines. Hot springs, mud pots, and fumaroles occur near the head of Big Fox Creek, south of the volcano. Historical eruptions have been recorded since the late-19th century. Keller F, Meuschke J L, Alldredge L R, 1954. Aeromagnetic surveys in the Aleutian, Marshall, and Bermuda Islands. Eos, Trans Amer Geophys Union, 35: 558-572. Romick J D, Kay S M, Kay R W, 1992. The influence of amphibole fractionation on the evolution of calc-alkaline andesite and dacite tephra from the central Aleutians, Alaska. Contr Mineral Petr 112: 101-118. Simons F S, Mathewson D E, 1955. Geology of Great Sitkin Island, Alaska. U S Geol Surv Bull, 1028-B: 29-32. There is no Deformation History data available for Great Sitkin. There is no Emissions History data available for Great Sitkin. 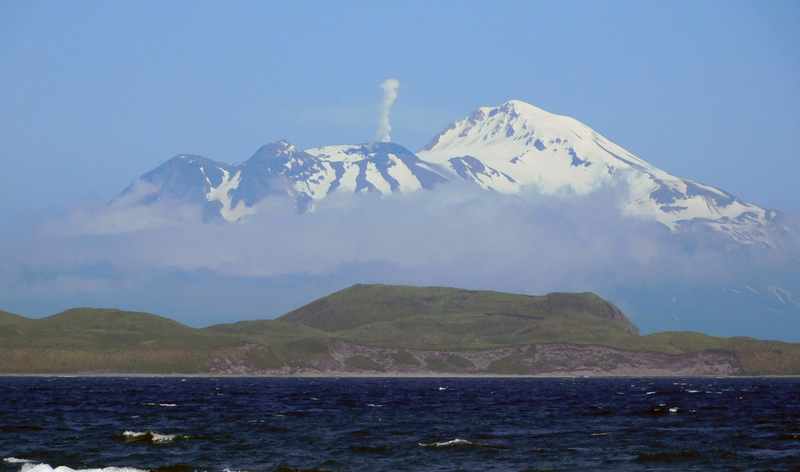 Great Sitkin volcano in the Andreanof Islands of the central Aleutians is seen here rising to the NE across Sitkin Sound from Finger Bay on Adak Island. The volcano was constructed within the caldera of an older shield volcano, part of which forms the high snow-covered peak at the right. The 1740-m-high post-caldera cone of Great Sitkin volcano itself contains a small, 0.8 x 1.2 km ice-filled summit caldera, whose rim forms the irregular summit on the left horizon. In 1945, a 400-600-m wide lava dome was emplaced through a glacier filling this caldera. Photo by Fred Zeillemaker, 1982 (U.S. Fish and Wildlife Service, courtesy of Alaska Volcano Observatory). This September 1946 photo of Great Sitkin volcano from the east rim of the summit crater shows a steam plume rising above a lava dome emplaced in the crater in March 1945. The prominent fissures cutting the summit icecap were produced as the dome forced its way through the summit glacier. The oval-shaped blocky dome is formed of glassy basaltic rocks. Photo courtesy of U.S. Geological Survey (published in USGS Bulletin 1028-B). There are no samples for Great Sitkin in the Smithsonian's NMNH Department of Mineral Sciences Rock and Ore collection. Large Eruptions of Great Sitkin Information about large Quaternary eruptions (VEI >= 4) is cataloged in the Large Magnitude Explosive Volcanic Eruptions (LaMEVE) database of the Volcano Global Risk Identification and Analysis Project (VOGRIPA).